River Cottage HQ, found on the Devon and Dorset border, is home to the Cookery and Chefs' School, unique dining experiences and memorable events. The River Cottage Canteen, based in Axminster - one of the award-winning restaurants and delis based in the South West where they combine their philosophy with the finest producers. Axminster: an unspoilt Devon market town surrounded by stunning countryside and filled with charm and character. The beautiful iconic Saxon church of St Mary stands on Minster Green right in the centre of town. Situated on the River Axe, the attractive ancient market town of Axminster lies in the beautiful Axe Valley, an Area of Outstanding Natural Beauty, boasting quaint villages and unspoilt countryside. 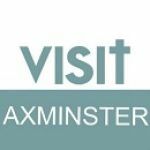 Situated a few miles inland from the Jurassic Coast, tucked in the south east corner of Devon, Axminster is an ideal touring centre for the neighbouring counties of Somerset and Dorset. Barton View is a contemporary bed and breakfast in a pretty hamlet in East Devon, close to the Dorset border. Its position means you're perfectly placed for discovering the breathtaking Jurassic Coast and the towns along its length, including Lyme Regis, Bridport and Sidmouth, as well as the picture-postcard villages of Beer and Branscombe. The area is packed with excellent pubs and restaurants, notably Hix Oyster & Fish House and River Cottage HQ and Canteen, both a short drive away. Whether you're looking for somewhere magical to stay or want to come on a relaxing green woodworking course, visit our beautiful woodland all year round for a unique and unforgettable experience. Three holiday cottages located at different stunning locations within the Axe Valley in East Devon, offer spacious, comfortable and well equipped self catering accommodation. 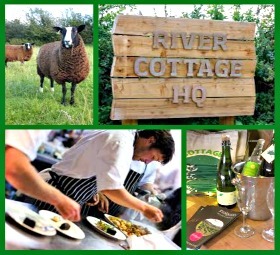 River Cottage HQ & Canteen, and Axminster Tools Skills Centre, renowned for their woodturning courses, are only a short distance from the cottage. A family run business founded over 30 years ago dedicated to providing the very best choice of independently inspected holiday homes in Lyme Regis and the surrounding coastal and countryside areas. Situated in some of East Devon's most spectacular countryside, Spillers Farm B&B accommodation and holiday cottage is a haven of peace and tranquillity. Nestling in the beautiful village of Musbury, near Axminster, in the Axe Valley, Spillers Farm B&B is a working smallholding, ideal for those going to Hugh Fernley-Whittingstall's River Cottage HQ or canteen. Spillers Farm is one of the closest B&Bs being just a a five minute drive away from both. Swan Hill House is a Victorian Villa in the East Devon village of Colyford. Run by Simon and Libby with a commitment to make guests feel relaxed by delivering our best service in a comfortable, clean and peaceful home. Located in Colyford making it an ideal base for River Cottage or the East Devon coast. The Dower House Hotel offers eleven comfortable and tastefully appointed guest bedrooms with en suite bathrooms. Surrounded by rolling hills and open fields, views from the lounge bar, sitting room and bedrooms are stunning. Additionally, we have over two acres of gardens, an outdoor swimming pool and ample parking for use during your stay. In addition we are pet friendly and welcome dogs in specific rooms by prior arrangement. The Tytherleigh Arms, a family run 16th Century Coaching Inn located just outside Axminster. Wyke Farm, a 17th Century grade II listed farmhouse set in the rolling countryside bordering Devon, Dorset and Somerset yet only 5 miles away from the beaches of Lyme Regis and the South West coastal path. Ideally placed for visiting the nearby River Cottage canteen and HQ. Auto Solutions is based in Axminster, Devon. We offer servicing, repairs, modifications and diagnostic facilities to our customers for all vehicle manufacturers. Our workshop is open from 08:30am to 17:30pm Monday to Friday and 09:00am to 14:00pm on Saturdays. No job is too big or too small - if you are unsure what you really need, feel free to give us a call and one of our technicians will be happy to talk things through with you!